The CAR2112.FC6267 TAG Heuer 300 SLR Calibre 1887 Chronograph Men’s Watch is part of the latest additions to the SLR line, and was recently debuted at the Basel Fair in Switzerland. This limited edition watch is not yet available to the public, and is sure to be snatched up by collectors when it is released in October of 2010. The TAG Heuer 300 SLR Calibre 1887 Chronograph is a limited edition watch for Mercedes-Benz, limited to only 1887 pieces. Atypical of many TAG Heuer styles, this timepiece sports a deep brown dial matched with a brown leather strap that has been perforated and lined with orange. On the dial are three counters: chronograph hours and minutes are at 6 o’clock and 12 o’clock, respectively; and running seconds can be found at 9 o’clock. Also at the 6 o’clock position is a date window. A vintage monochrome company logo can be found on the dial. There is also a tachymeter scale located on the flange of the watch. 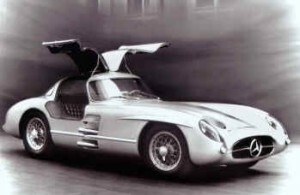 The case back of the 300 SLR is a screw-in type and features a specialized Mercedes-Benz engraved decoration. Also on the case back is the identifying number, out of 1887. The case is made from polished stainless steel, and the crystal is domed sapphire with anti-reflective treatment on both sides. The watch is water resistant to 100 meters.